Believe it or not, cathode ray tubes (CRTs) are still manufactured for specialty products and for replacement parts. Even with a high level of automation, there are still steps in the manufacturing process that require human handling. A comparison between CRT plants in the USA and Germany show the similarity but distinctly different processes in a Sylvania and Telefunken operations, respectively. 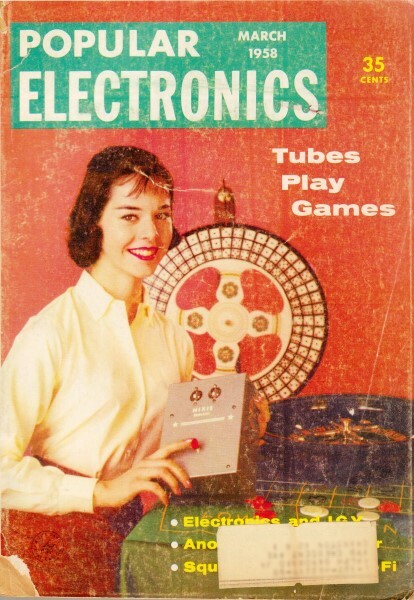 The photos shown are from an article in a 1958 edition of Popular Electronics. At the bottom of this page are videos of a modern CRT manufacturing process and a CRT recycling effort. As you will see, properly recycling a CRT is about as manually intensive as manufacturing one (but with no quality control and functionality concerns). I am not sure where the profit is in recycling unless inflation over the 10-20 years since manufacturing makes the value of materials worth the effort. A très cool documentary film on the designing and manufacturing process of RCA Victor television sets is at the very bottom. 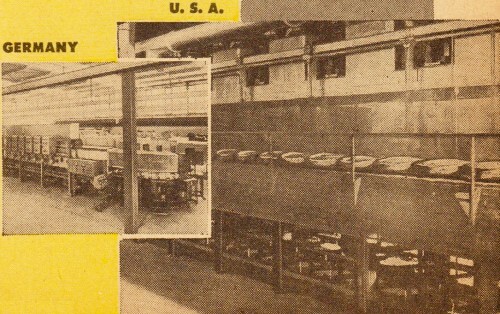 1 Bulb washing with hydrofluoric acid, then water, is done on assembly line at Sylvania, and on circular "washautomaton" at Telefunken. In this and following steps, the process in both plants is generally automatic, but workers move bulbs from one line to next. 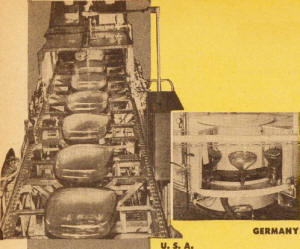 2 After "screen settling," bulbs filled with a phosphor solution are "poured" off as they move along vibration-free conveyor belts. When the fluorescent coating has dried, a thin lacquer coating is applied in the same manner, to serve as a base for aluminizing - the next step. 3 To assure brighter screen and clearer raster, both plants apply an aluminum coating to the inside of the bulb. A small piece of aluminum is heated to incandescence in the evacuated bulb, depositing a micron-thin film of the metal over the interior lacquer coating which was applied earlier. 4 Baking in lehr (oven) removes lacquer coat, leaving a smooth aluminum coat. 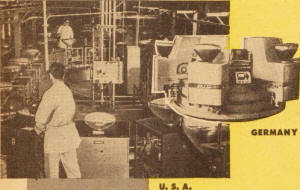 5 The sealing process is the marriage of bulb and gun, effected in both plants on a circular assembly line. While the German photo does not show it, the bulbs must be placed on the line by workers, as in the Sylvania shot. Sealing is automatic as is following inspection process. 6 Evacuating the tubes at high temperature is accomplished on a screened-off line as a safeguard against implosions, which occur infrequently. 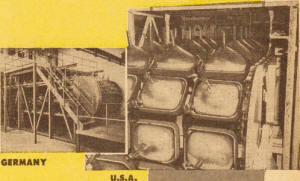 "Getter" is then flashed to absorb foreign gases, after which the tubes are aged and tested. Inspection and packing are last. Now, here is how they are properly disposed of after their useful lifetime. 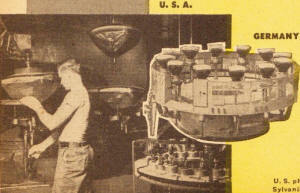 This is an RCA Victor Television Production Plant Documentary - Dig the Test Equipment! 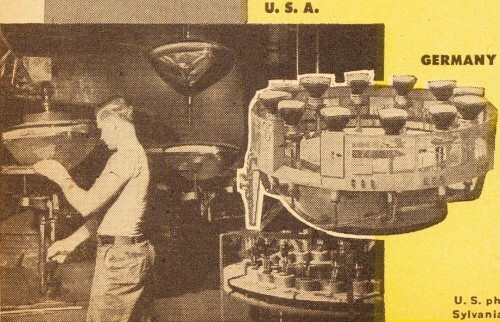 If you take the time to watch this video of the RCA Victor television development process, you will be impressed with the amount of engineering that went into those units. By contrast, a large percentage of the manual design and testing in today's electronics is done on a computer with simulation programs (typically NOT in America). Huge databases of component characteristics data are available for just about every electrical, mechanical, and chemical parameter of every type of material. All of this significantly cuts down on design and development time needed for getting products to market. Every capacitor, resistor, inductor, transformer, tube base, connector, cable, and every wire connecting all the parts together had to be installed by hand back in the era. The same goes for mechanical assemblies. There were no automated test protocols for checking accelerated lifetimes and FCC compliance (see the OATS* setup in the video). Documentation was drawn on a drafting board with a pencil and typed on paper with typewriters. 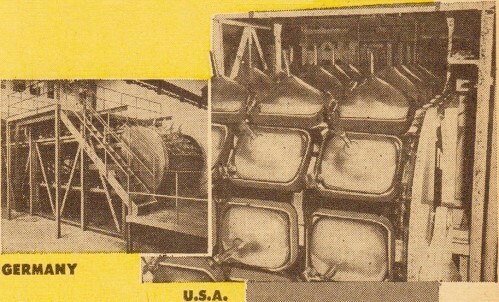 Promotional material and user manuals were laid out on a cutting and lay-up board where text and graphics needed to be brought together. It was a lot of work that kept a huge army of highly skilled engineers, technicians, draftsmen, stylists, and craftsmen employed, many of whom had cut their teeth during the WWII and Korean War defense contracting eras. America and most other Western countries were powerhouses of intellectual and physical creativity hands-on genius. Nowadays our factories are empty and the national know-how is focused on playing video games and perfecting ways to have the government give you other people's hard-earned stuff.